Methylates toxic homocysteine into methionine. 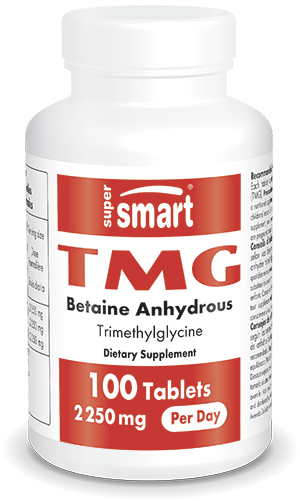 Also known as betaine, trimethylglycine occurs naturally in many of the body's tissues. As we get older, methylation decreases, leading to a potential rise in homocysteine levels. Raised blood levels of homocysteine increase the risk of cardiovascular disease and other age-related diseases. ¤ As TMG is involved in the metabolism of homocysteine, it is particularly important for the prevention of cardiovascular disease. As a methyl group donor, it converts homocysteine into methionine, and then into SAMe. Studies suggest that TMG supplementation lowers homocysteine concentrations in a dose-dependant manner - by up to 20% with a daily dose of 6 g.
¤ Animal studies indicate that TMG helps to protect the liver and increases levels of SAMe. The first stage in alcohol-induced hepatic lesions is the accumulation of fats in the liver. Human studies have shown the efficacy of TMG in significantly improving these hepatic lesions. It is recommended that TMG supplements be accompanied by a multivitamin with substantial amounts of vitamins B6, B12 and folic acid, since these nutrients are also involved in the methylation cycle. Each tablet provides 750 mg of TMG. Take 1 to 3 tablets a day as required.